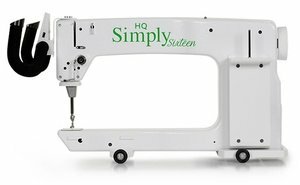 With the HQ Little Foot Frame system, the HQ Simply Sixteen enables any qu9ilters, beginner to advanced, to finish any size quilt without the space requirements of a conventional frame system. Integrated technology and engineering provide the functionality that quilters demand, paired with the smoothest stitch in the industry. Please contact the store at 703.261.6366 for more information.